The Nokia Lumia 1330 is not exactly official, but Microsoft Indonesia is already teasing the mid-range Windows Phone phablet. It's advertising the dual-SIM connectivity, which will come in LTE and 3G versions. 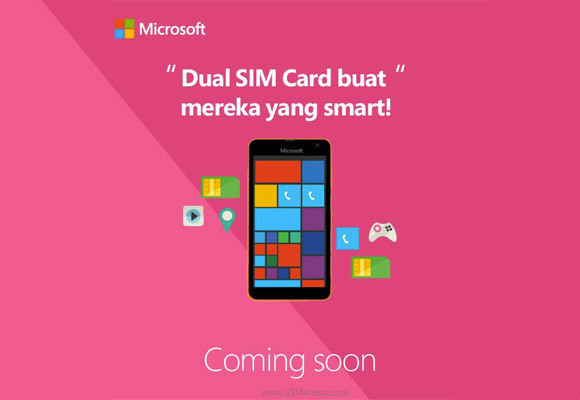 LTE-enabled dual-SIMs are rare, this will be the first Lumia to do it. Other versions include three single-SIM options – one with LTE-Advanced, one with regular LTE and one with just 3G. They will have a 5.7" 720p screen according to leaked benchmarks, though those are not very accurate so the Lumia 1330 can still have a 6" screen like its predecessor. It will have a much better camera though, the current expectations are for a 14MP shooter with Zeiss optics and 1080p video, plus a 5MP seflie camera. So far, so good though the chipset is rumored to be a Snapdragon 400 with 1GB of RAM, which doesn’t sound terribly exciting. Anyway, the teaser just says "Coming soon" and with a Microsoft event scheduled for the MWC (on March 2) we just might see an official unveiling in a couple of weeks. Or the event could be just about Windows 10. Well fortunately in Indonesia, Microsoft Devices aka Nokia always selling an unlocked phone. So i bet this Lumia will coming for all carrier. But, that's in Indonesia. I don't know about other country or region. Make it available to all carriers and make money.